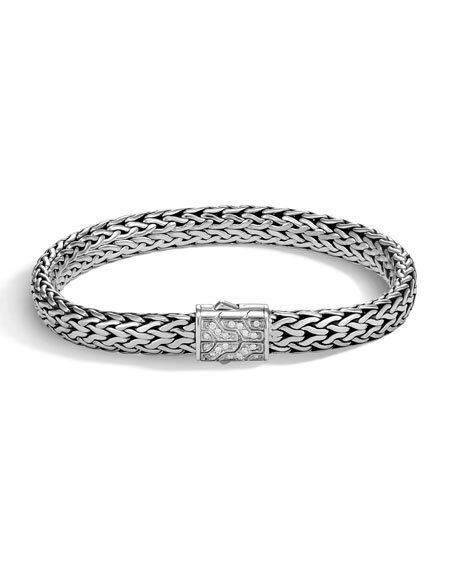 Pusher clasp with diamond pave, 0.13 total carat weight. Cross charm bracelet by Emanuele Bicocchi. Sterling silver ball chain with cross dangle. Logo engraving at lobster clasp. Handmade in Italy. Agate bracelet by Emanuele Bicocchi. Sterling silver braided chain hardware. Round black agate beading. Lobster clasp. Made in Italy. Braided bracelet by Emanuele Bicocchi. Black rhodium-plated sterling silver. Fishtail braided foxtail chains. Lobster clasp. Handmade in Italy. Quartz bracelet by Emanuele Bicocchi. Sterling silver braided chain hardware. Round gray quartz beading. Lobster clasp. Made in Italy.